This easy Peanut Butter Blossoms cookies recipe is straight from your childhood! It’s the Hershey’s classic that’s soft and chewy with the Kiss melting in the center just like you remember. It’s one of those recipes that goes together fast – in no time at all you’ll be munching one and washing it down with cold milk. You DO wash it down with milk, right? They freeze well, too so they’re great for making ahead of time for holiday giving. Just FYI- I’m pretty certain that these are Santa’s favorites. This post has been updated from the original December 2017 version. Last updated November 2018. I don’t know why I don’t use this peanut butter blossoms recipe all year long but I don’t. Most of the year, when I bake cookies, I make a classic chocolate chip cookie recipe, peanut butter cookies, or my favorite oatmeal cookies. Admittedly, I’m baking cookies a lot less than I used to. I’m feelin’ it, y’all. I’m not ready for the mom stage of my life to be over. I miss making those memories with my kids – oh I know I can make memories with the grandkids and I do as much as I can but it’s different. We eat out more often, just my husband and I, because everyone is at activities and it’s just us. The house is quieter than it used to be and family dinners are often get your own due to schedules. When the cookie jar IS full the cookies often last long enough to get stale. Inconceivable. I don’t think that’s ever happened before. Old fashioned Peanut Butter Blossoms are soft and chewy with a thin crispy crust. One of the things I really like about these peanut butter kiss cookies is that they freeze so well, either baked or unbaked, so I can make a full batch then have them on hand. I prefer to freeze them unbaked so that I can serve them fresh and warm, with the Hershey’s Kiss melting in the center. Form the dough into balls and roll in the sugar. Place them close together on a cookie sheet. Put the cookie sheet in the freezer until the balls of dough are completely frozen. Take off the cookie sheet, toss in a freezer container, and return to the freezer. When you’re ready for some cookies take out as many dough balls as you need. Put them about 2 inches apart on an ungreased cookie sheet. Bake as directed (but they may need an extra few minutes). Remove from the oven and add the Hershey’s Kisses as directed in the recipe. A lot of Peanut Butter Blossoms cookie recipes call for shortening but I prefer butter. You can use shortening instead if you want. The dough is kind of soft so you’ll want to chill it for an hour or so before you try to shape the cookies. It’s actually best if you chill it overnight. Have the Hershey’s Kisses unwrapped and ready to go before you put the cookies in the oven. 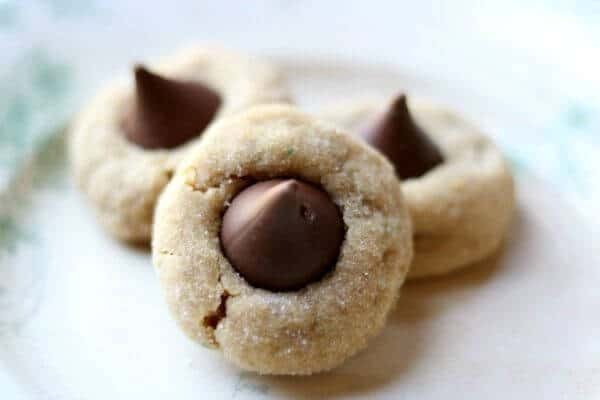 When you add the Hershey’s Kiss press it down gently just enough to help it adhere to the surface of the cookie. If you let the cookie cool for about 3 minutes before adding the Kiss it will help it keep its shape. You can also put them straight in the freezer for a quick chill once you’ve added the Kiss – that will help, too. They also are the perfect cookie for sending to school plus they ship really well so are good for sending to loved ones away at college or in the military. These peanut butter Hershey’s Kiss cookies freeze AND ship well. Perfect for sending to loved who are far away. 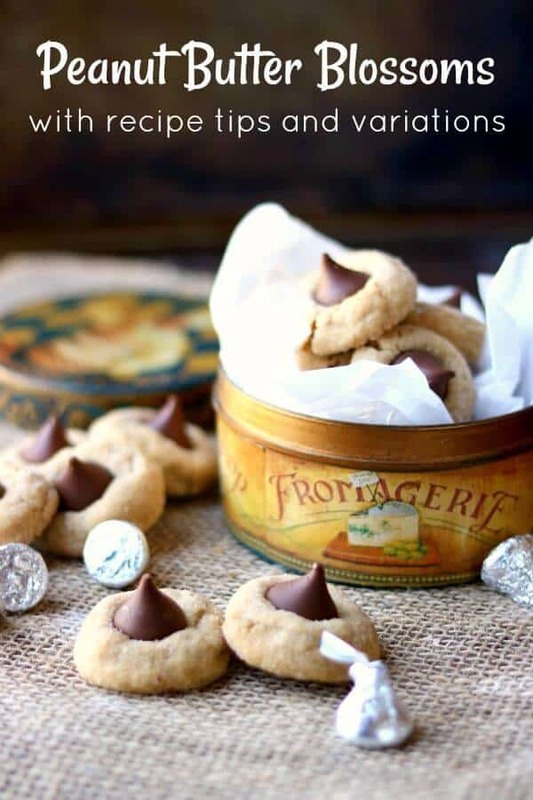 These classic Hershey’s peanut butter blossoms cookies are versatile, too. 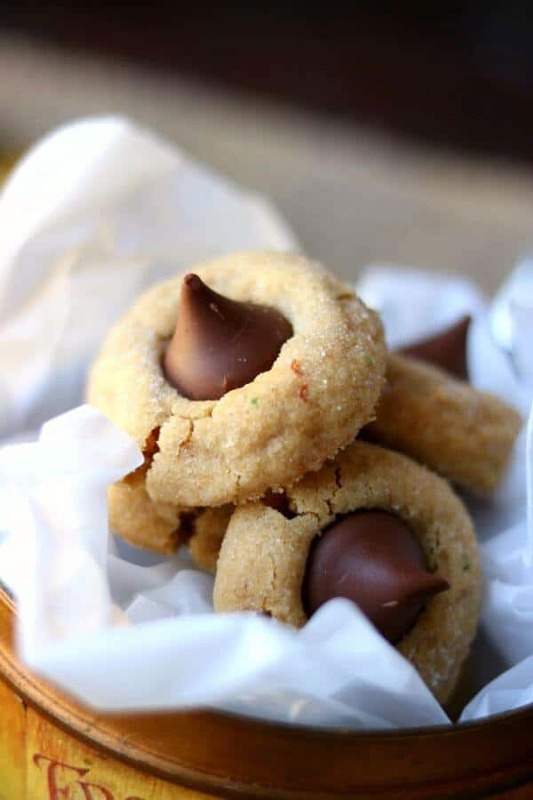 By the way, do you call them peanut butter blossoms or peanut butter kiss cookies? Honestly, here they are forever known as “those peanut butter cookies with the Hershey’s in the middle”. The coarser the sugar the more crunchy the outside of the cookie will be so try different types of sugar crystals like turbinado, raw sugar, etc. I like rolling them in white sugar but colored sanding sugar is festive, too! These cookies are easy enough for most elementary aged kids to make with a little supervision. The uncooked dough can be stored in the refrigerator for up to 3 days or frozen for up to 3 months. Once baked they’ll be fine for a week or so at room temperature (like they’re really going to last that long?) or freeze for longer storage. What Are Some Other Names for Peanut Butter Blossoms Cookies? No matter what you call these old fashioned peanut butter cookies they are delicious! Good cookie sheets make all the difference in the texture of your cookies and whether or not the bottoms burn. I like these heavy duty cookie sheets from Calphalon. They’ll last for years. Here are some of my favorite Christmas Cookies recipes found here on the blog. I hope you love them, too! Chill the cookies as soon as you put the Kiss on top to help them keep their shape. 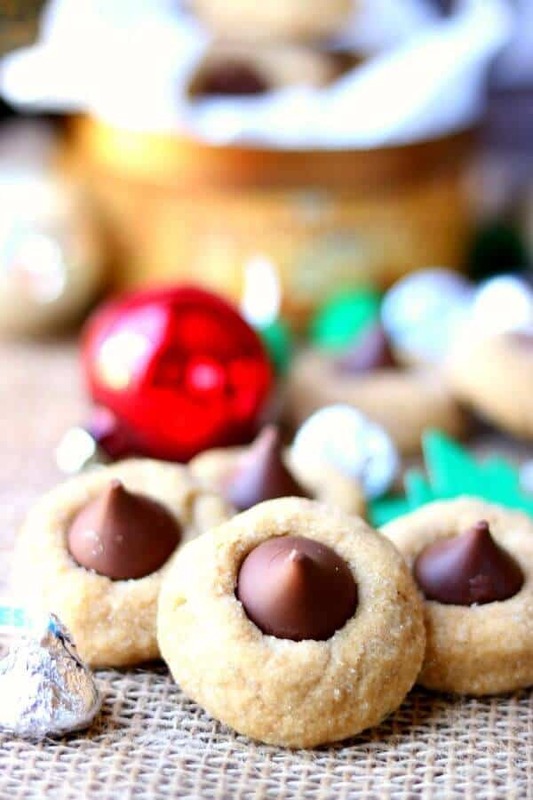 There’s more than one Peanut Butter Blossoms recipe floating around but this is my favorite. The cookies have lots of peanut butter flavor, they’re chewy, and they’re made with butter, not shortening. 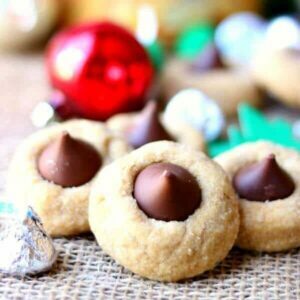 They’re one of my favorite Christmas cookies recipes to make with kids because even little kids can unwrap the Kisses! 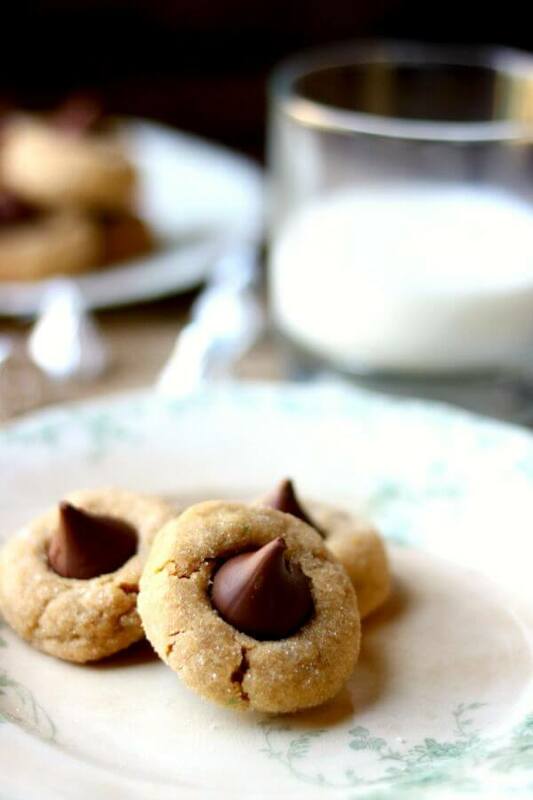 A peanut butter blossoms recipe straight from your childhood, this Hershey's classic is soft and chewy just like you remember. This easy peanut butter cookie recipe goes together fast - in no time at all you'll be munching one and washing it down with cold milk. They freeze well, too. Combine the butter and peanut butter in bowl. Add both the granulated and brown sugars and beat at medium speed until light and fluffy. Add egg, and vanilla; continue beating until well blended. Add flour and baking soda then beat at low speed, scraping bowl often, until it's completely mixed. Roll balls in 1/4 cup vanilla sugar. Gently press 1 chocolate kiss in center of each cookie. Let cool on cookie sheets for 5 minutes. Place in freezer for about 10 minutes or until the chocolate hardens back up. how much salt ?? 🙁 It doesn’t say…. There’s no salt… that was a typo. The peanut butter has enough salt.